For the 6th edition of Soul Confectionery parties we’ve invited a special guest who with no doubt, knows how to rock a party! 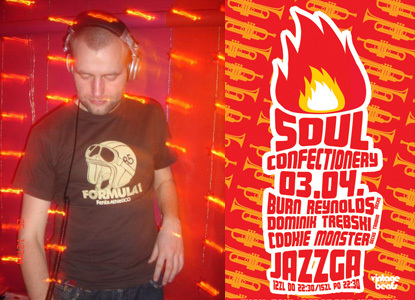 Burn Reynolds is a member of the one of the most important funky crews in Poland - Soul Service. He forms this crew together with Papa Zura, Cpt.Sparky and Misty. Reynolds has started playing parties in local soundsystems in 90’s. He used to be a radio dj in “Fusion” programm [Jazz Radio] where he was of course focused mostly on soul, funk, jazz, reggae, disco and similar genres of music. In Warsaw he used to play parties called “Fullkolor” in Pruderia club, “Brown Sugar” in Paprotka. Thanks to him we could hear such artists in Poland as Soul Jazz Soundsystem, Smoove (Acid Jazz Rec. ), Florian Keller (Compost, Perfect Toy), Beathoven (Puma Strut), Henry Storch (Unique Rec. ), Stupid Deep. He played with such djs as Nicky Siano (Gallery, NY), Ed Piller (together with Gilles Peterson he formed Acid Jazz records), Andy Votel (B-Music, Finders Keepers), Bobby Boucher (Puma Strut),Joseph Malik (Compost), 7 Samurai (G.A.M.M) and many many more. He is also a host dj of Balsam club. The second guest of the evening- Dominik Trębski is a musician mostly known from Tworzywo Sztuczne band. At the moment he is focused on Muzykoterapia (together with Iza Kowalewska and Wojtek Traczyk). As always the host dj of series -Cookie Monster will support his guests.